Welcome to my new home! Eating and living is now Korean Bapsang. In my 2-year anniversary post last year, I told you that I was in the process of giving my blog a new face and a new name. Yay, we are finally here! I had hoped to launch it on my 3-year blog anniversary in August but didn’t quite make it. So, here’s a belated happy anniversary! 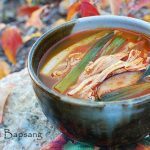 After a long search of a new name that would closely reflect the theme of my Korean home cooking blog, Korean Bapsang was born. Bapsang (밥상) means a table at which meals are enjoyed. (To hear what it sounds like in Korean, click on the Korean word link and click on the speaker next to the word.) The word bapsang is made up of two words bap (cooked rice) and sang (table). It’s pretty obvious from this how important rice is in Korean cuisine. 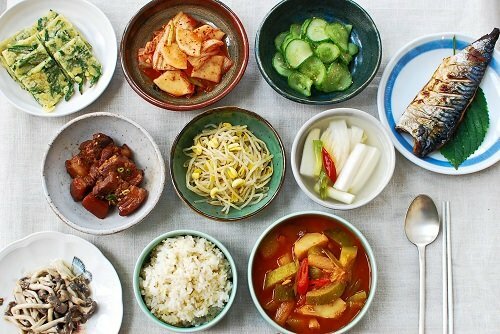 The typical Korean table consists of rice, soup or stew, and several side dishes. 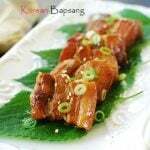 Through this blog, Korean Bapsang, I will continue to provide delicious easy-to-follow recipes for your Korean table. And, how do you like the new look? The logo is a gujeolpan, a nine-section tray that is used to serve traditional delicacies. The earthenware (onggi/hangahri) are pots used to store fermented food such as gochujang (red chili pepper paste), doenjang (soybean paste), ganjang (soy sauce), and kimchi. All this is complemented by a traditional pattern in the background and a bright green bar with saekdong — a multi-color stripe pattern commonly used in traditional clothes (hanbok) — at the top of the page. 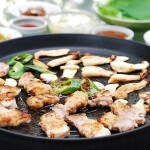 The old URL (eatingandliving.blogspot.com) automatically redirects to the new URL (koreanbapsang.com). As such, your prior bookmarks should work as is. Please let me know if you encounter any issues related to the transition (not receiving updates through RSS feed or e-mails, etc.). To my fellow bloggers, if you currently link to my blog on your blogroll, it’d be greatly appreciated if you could update the name of the blog to Korean Bapsang to reflect the change. Hope you like this new home as much as I do. Thanks always for your continuing support! Congratulations on your new home! The new logo and wallpaper look great and so are the dishes you have prepared! 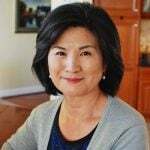 Thank you sooo much for sharing your recipes & for educating us about the Korean Culture. I totally love korean food, so I’m glad I’ll be able to prepare the food for my family & friends. You’re welcome! I am happy to be helpful. Let me know if you have any questions as you go along. Thanks! Yoohoo! This looks beautiful, Hyosun!! Congrats on a new look and on 3 years of blogging!!! Your new blog design look fantastic, and I love your logo and the new name! I wish you many, many more years of blogging and thank you for always sharing such a delicious, beautiful and easy recipes. Very bright and spanking new look indeed, love it! Oops tried to post, but I guess I still can’t post with my wordpress login… Congratulations on 3 years of blogging and your new blog home. Looks great! Hm, am I the only one having trouble posting comments using wordpress username? Anyway, huge congratulations on 3 years of blogging and on your new home!!! Congratulations on the new site, wish you all the best and I’ll enjoy further reading too. Come join my event sometime……..
Love the new look! 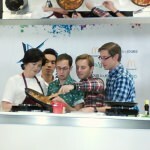 And looking forward to more Korean deliciousness to come! Your new layout looks great, looking forward to seeing what’s next! thanks for the many recipes you have shared, I’ve tried a lot. 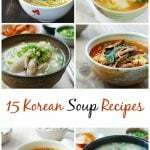 You’re always my “go to” for a korean recipe! So glad you are continuing your blog. I really value yourrecipes. 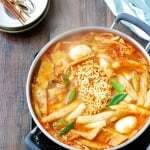 I am Korean American and trying to cook more Korean food. I can tell you have great recipes that produce quality food!! After living in Seoul for 6 years recently, I have a new appreciation for Korean food, especially it’s nutritional value in a fast food generation. I have been visiting your blog, all sneaky like, for a while now. Your recipes are easy to follow and OH SO TASTY! I have a little notebook where the dates of yummies I want to learn are written. I LOVE your new side bar over there ->. CONGRATULATIONS about this new and improved blog space! It is wonderful and very nicely put together. AND THANK YOU for sharing your table with us. I think you’re a swell gal! So far I am enjoying myself reading your posts. It makes me learn so much more about Korea and its culture. I stumbled on your site a couple weeks back and it has been amazing. My husband is Korean and I’m Vietnamese, so he doesn’t get many Korean meals. He never complains, but I know he prefers his native food. All your recipes are easy to follow and the pictures make it even easier. I’m amazed on how easy it is to prepare the dishes. I have made soups, appetizers, kalbi, bulgogi…and it has all turned out wonderfully! My husband joked that he must have married a Korean woman the other night. I am so unbelievably grateful for your site, and when your cook book is published I will be sure to get a copy. Thanks for doing what you do! Can you please post a recipe on omurice?